We’d love your help. Let us know what’s wrong with this preview of Wild Fire by Ann Cleeves. When the Flemings--designer Helena and architect Daniel--move into a remote community in the north of Shetland, they think it's a fresh start for themselves and their children. A story of dysfunctional families and fractured relation When the Flemings--designer Helena and architect Daniel--move into a remote community in the north of Shetland, they think it's a fresh start for themselves and their children. To ask other readers questions about Wild Fire, please sign up. Why has cassie _frans daughter gone back to being a child ? She was at university in previous books . Annamarie She is a child in the books, never a teenager. Are there any Authors similar to Ann Cleeves? Dee Weaver Peter May's trilogy set on the island of Lewis is worth a read, and very similar to the atmosphere of the Shetland series. This is the last in the Ann Cleeves wonderful Shetland set series featuring DI Jimmy Perez. This is a shame because I have loved this series and this latest addition is brilliant. Helen, knitwear designer and her architect husband, Daniel, with their children, autistic Christopher, and Ellie, are recent incomers to the island, hoping for a fresh start from their busy London lives. However, in Deltaness, they have had the previous owner of Hesti, their home, hang himself in the barn and been gree This is the last in the Ann Cleeves wonderful Shetland set series featuring DI Jimmy Perez. This is a shame because I have loved this series and this latest addition is brilliant. Helen, knitwear designer and her architect husband, Daniel, with their children, autistic Christopher, and Ellie, are recent incomers to the island, hoping for a fresh start from their busy London lives. However, in Deltaness, they have had the previous owner of Hesti, their home, hang himself in the barn and been greeted by hate, resentment and jealousy by the locals. Upon receiving anonymous notes with a hangman, Helen is unsettled, finding Deltaness claustrophobic and gossipy, while Christopher, who is mesmerised by fire, is shunned by fellow pupils and lives a largely solitary existence. It is Christopher who discovers the hanged body of the Moncrieff's nanny, Emma Shearer in the barn. Chief Inspector Willow Reeves returns to Shetland with personal news for Perez which he handles rather badly, and despite the tensions that arise between them, they need to find a way of working together on the case. Emma had a traumatic history of family domestic violence that resulted in her father being imprisoned. At 17 years old, Emma is recommended to Dr Robert Moncrieff as a nanny, and ever since, she has helped in their home and looked after their four children through the years. With her retro 1950s elegant hand made dresses, she has caught the eyes of a number of men. The Moncrieffs and the Flemings are the main suspects in the wide ranging inquiry. The malicious and vindictive Margaret Riddell is one of the main sources of gossip and rumours in the community, a woman bursting with resentment and jealousy, antagonistic to the Flemings and the Moncrieffs, with a son, Magnie, who had been seeing Emma. The death of Emma is a tragedy that affects everyone who knew her, ensuring that they all become victims too. Shetland island has certainly seen it's fair share of murder and mayhem. A relative newcomer to the island, Helene, begins to receive crpyptic drawings of hanging men, a thinky veiled reference to the previous owner of their house who was found hanged in their barn. Soon after she shows the drawings to Perez, another body is found hanged in their barn, this time a young woman who was the nanny for another found. This murder will bring, Jimmy, Willow and Sandy together for one final outing. A case Shetland island has certainly seen it's fair share of murder and mayhem. A relative newcomer to the island, Helene, begins to receive crpyptic drawings of hanging men, a thinky veiled reference to the previous owner of their house who was found hanged in their barn. Soon after she shows the drawings to Perez, another body is found hanged in their barn, this time a young woman who was the nanny for another found. This murder will bring, Jimmy, Willow and Sandy together for one final outing. A case with many strings, threads leading to a hidden and past life, a young boy on the autism spectrum, a husband and father, and a woman with a secret who cannot forgive nor forget. Sometimes people are just not who you think they are. The clues are there, in retrospect, but admit to missing them. The case is suspenseful enough, but the atmosphere of the island, and the characters have for me, always been the draw for me. Although I admit I liked done of the books in this series, better than others, it has never disappointed me. So as Jimmy, Willow and Sandy leave the pages of future books, may they ride off into the sunset, finding happiness wherever they land. Smaltzy, I know but i couldn't resist and I'm really going to miss this series, characters that felt like friends. I have read some, but not all, of the books in the Shetland series. There are strands carried forward from books I hadn’t read, but it was easy to get up to speed. This book works fine as a stand alone. The Flemings have recently moved to the island and their arrival has upset the locals. The prior owner hung himself in the byre and for some reason, they are blamed. I loved Cleve’s points about the herd mentality and how gossip spreads through the island like wildfire. Then, a nanny for another family is found hanged in the same byre. This is a straightforward, well told police procedural. No fancy gimmicks here. Each character is well developed and fleshed out. I can’t say I really understood Jimmy’s reaction to Willow’s news, but that might be because I’ve missed the more recent books. I have to admit to not having a single clue as to who the murderer was. I will be making sure to go back and read the few I’ve missed. My thanks to netgalley and Minotaur Books for an advance copy of this book. This is my first Ann Cleeves novel and I seem to have come in on the tail end as Wild Fire is the eighth and final novel in Cleeves’ Shetland series featuring DI Jimmy Perez. I did wonder if I would find the characters difficult to connect with coming into the story at the end of the series but this book can easily be read as a standalone. There were occasional references of past events however nothing that prevented me from grasping the storyline. 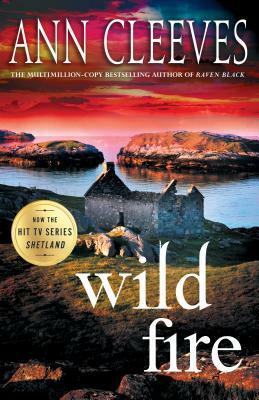 Wild Fire was an enjoyable, easy read featuring a This is my first Ann Cleeves novel and I seem to have come in on the tail end as Wild Fire is the eighth and final novel in Cleeves’ Shetland series featuring DI Jimmy Perez. Wild Fire was an enjoyable, easy read featuring a compelling mystery which kept my focus throughout. I found I became swept up in the lives of the people of Deltaness. Helena, Daniel and their two children hoping to escape their busy London lives have moved to the quiet town of Deltaness located in the Shetland Islands. Malicious gossip and anonymous notes leave Helena wondering if they will ever be accepted in the community or will forever be the newcomers. When a young woman is found murdered in a barn on the newcomers’ land Perez’s first impression is this is to do with the family not being accepted but when a born and raised local is found murdered he must rethink his ideas and try to find out how these two people were linked. In true murder mystery style Cleeves gives out just enough information to have the reader believing anyone could have and had cause to murder the victims. The characters are well drawn from the newcomers to the island, that feel like they don’t quite fit in, to the bitter gossiper who feels the need to dissect everyone’s actions and spread malicious gossip. I actually thought I had the murderer pegged until my main suspect turned up as the next victim. To finish off the series Cleeves gives Perez’s life a major upheaval which has him contemplating where he wants his future to go. Many readers will be sad to see the end of DI Jimmy Perez and the Shetland series but I am happy to say I still have seven more books in the series to read and I’m eagerly looking forward to them. If you enjoy old-style murder mysteries this series is for you. *My thanks to Pan Macmillan for my copy to read. Life seems to designate our personal flame. Some smoulder beneath the surface for eons. Some lend a spark that quickly is extinguished. And some set the makings of an eventual bonfire seen mile upon mile away from its original source. Ann Cleeves sets the stage, once again, in the atmospheric wonderland of Shetland Island. Wedging your way into the confines of this close knit community is a steep challenge for newcomers. Helena and her husband, Daniel, have brought their family to a start-over ho Life seems to designate our personal flame. Ann Cleeves sets the stage, once again, in the atmospheric wonderland of Shetland Island. Wedging your way into the confines of this close knit community is a steep challenge for newcomers. Helena and her husband, Daniel, have brought their family to a start-over home in this rugged terrain. Both young Ellie and Christopher are scrutinized by the Mom Squad as they wait each morning to enter the doors of the local school. But it's the character of Christopher who adds the special flavor to this story. Being on the autistic spectrum, Christopher's view of the world is just that.....Christopher's view. He aligns his life within his own footsteps and reacts to the excessiveness of sound, information, and the instant demands of processing. He prefers the santuary of his room where the pace can be accepted or rejected by his own pursuits. And Christopher knows when life outsteps routine. The idyllic surroundings of the island take a sudden turn when the body of a young nanny is found dead in one of the family's out-buildings. All eyes turn toward Helena and Daniel. Is there a connection here with Emma? If not, then why was her body found on their property? Ann Cleeves has a special talent for drawing lines between characters. Suspicion rides a mighty horse in this one. So many characters with backstories and so many guilty possibilities. But then Detective Inspector Jimmy Perez steps forward to sort things out. He's a beloved character with long standing ties to this island. Jimmy Perez, himself, will be at the receiving end of some knock-you-off-your-own-foundation news that will catch readers off guard as well. After having watched several episodes of “Shetland” on PBS, I have now had the opportunity to read what is the final book in Ann Cleeves Shetland series featuring Jimmy Perez. While I have read books in the Vera series, this is, somewhat ironically, my first of the Shetland. Jimmy Perez, the lynchpin in both media settings, is depicted in both as the compassionate, thoughtful man of the islands and people. The land and sea, nature itself, are characters and affect people’s lives on many levels. After having watched several episodes of “Shetland” on PBS, I have now had the opportunity to read what is the final book in Ann Cleeves Shetland series featuring Jimmy Perez. While I have read books in the Vera series, this is, somewhat ironically, my first of the Shetland. Jimmy Perez, the lynchpin in both media settings, is depicted in both as the compassionate, thoughtful man of the islands and people. The land and sea, nature itself, are characters and affect people’s lives on many levels. The descriptions are so often just right. This is from two people taking a walk. the fringes, everywhere the call of lapwings and oystercatchers. A breeze blew the flowers and nothing seemed fixed. The story itself involves the death of a young woman who cares for the children of the island’s doctor. The backstory makes her death harder for all in the community. Daniel and Helena Fleming from London, have purchased an old farm lost by a local man, Dennis Gear, to foreclosure. They have restored and revived it as a home for themselves and their two children. They are resented by locals because Dennis Gear was their friend. Then the Fleming family became greater objects of gossip after Gear hanged himself in their barn. Now Emma Shearer, nanny to a neighbor family, is found hanging in the same place. But there are many questions. Was this actually murder? Who was Emma really and who knew her? And then there is a sub-plot, an interpersonal story involving Perez and his superior from the mainland, Willow. Everything moves along with all of the police, Perez, Willow and Sandy, acting separately and together to piece together the parts that will finally bring peace to the island. As the closing episode to a series, Wild Fire does offer some aspects of closure while also leaving open futures. All in all, a good read and recommended. This book can also be read and enjoyed as a stand-alone novel. The prose is intricate and deft. The characters are flawed, complex and intriguing. And the plot is a compelling, well crafted, police procedural full Mysterious, precise, and atmospheric! I was so sad when this book was over because it is the last of the series. I don't know why the author has discontinued it because I love everything about it from traveling to the Shetland Islands, the characters, the Island traditions, and the mysteries. If you have not read the others in the series, I recommend that you do just because they are so good. This book can be read as a stand alone but, of course, quite satisfying to long time fans. The Flemings have moved to the Shetlands where the wife, Helena, has opened a very successful knitting business (think Beyonce wearing the pieces) and her husband is an architect who redesigns the house they bought. They have two children with the oldest son autistic who likes to set fires and is shunned by the other children. Helena hired the wife of the local doctor to be her assistant and it is her nanny, Emma, that is found hanging in their barn. It wouldn't be as creepy if another body hadn't been found recently in the same situation. Outsiders are always looked at suspiciously by the locals and having two dead bodies found on your property doesn't help much. Local detective, Jimmy Perez, swings into action and when his boss, Willow, shows up to aid the investigation he gets blindsided by news he never expected to hear. I like that this is a straight forward police procedural without bells and whistles. It is solved by dogged police work and no there is no requirement to have to set belief aside. It all makes perfect sense. It is as clear as the Islands itself. This works so well because the author has a wonderful ability to make the Islands come alive and a place you long to visit. I took a 1/2 star off because I thought Perez displayed some very unPerez behavior and I was a trifle disappointed in him. Still it didn't spoil the work. I am thinking of organizing a world wide plea to Cleeves to write more. I will miss this series. "Hold your family close. Hold their secrets closer..."
'Wild Fire' is the eighth and final book in the international bestselling Shetland series featuring DI Jimmy Perez. Although it's preferable to have read the previous seven novels to understand the evolution of the characters and their lives, it does actually work as a standalone too. I am a huge Cleeves fan and love both her books and the TV series' that are adapted from said novels. One of the aspects I absolutely adore here is the setting. "Hold your family close. Hold their secrets closer..."
One of the aspects I absolutely adore here is the setting. Shetland is such a beautiful place, wild and sparse, green and remote, and Cleeves uses it as a character in itself. I certainly feel that if you know the landscapes of the islands off the coast of Scotland, you will love this series. Having holidayed on many of those islands, the descriptive prose took me back there. As an old school police procedural, the story features all of the elements I have come to expect from Ms Cleeves - well concealed killer(s), relationship/family dramas, exquisite prose and characterisation. The characters are relatable and realistic, but I was a little disappointed by the ending. There is little forensic evidence in the case, so the police have to work hard for little reward. Instead of the ubiquitous plot twists, the story relies on the slow unfurling of the case. Cleeves is an expert in crafting novels where the culprit is impossible to guess until the reveal arrives. I am extremely sad that we will no longer be able to read about DI Jimmy Perez's adventures, and although I thoroughly enjoyed the journey towards the conclusion, I found myself deflated by the resolution. I feel it is very important to produce a spectacular climax to a novel, but especally when it is the last book in a fantastic series. I know I will miss Perez as will many other readers. I felt there was much more to come from him, and his story didn't feel like it had come to an end. All in all, exactly what we have to come to expect from Cleeves: a wonderful setting, a thrilling story, exceptionally drawn characters and atmosphere. No one evokes the landscape better! Goodbye Jimmy, you'll be a miss! How refreshing to read an old skool police procedural with realistic characters, a natural prose style and none of those ubiquitous 'twists'! I haven't read any of this series before (or seen any of the recent TV adaptations) but it's fine to drop in on what turns out to be the last of the series. Cleeves cleverly updates the tropes of Agatha Christie so that here we have a closed circle of suspects, malicious anonymous letters, and a pair of murders. The ending isn't quite convincing but boy, I How refreshing to read an old skool police procedural with realistic characters, a natural prose style and none of those ubiquitous 'twists'! I haven't read any of this series before (or seen any of the recent TV adaptations) but it's fine to drop in on what turns out to be the last of the series. Cleeves cleverly updates the tropes of Agatha Christie so that here we have a closed circle of suspects, malicious anonymous letters, and a pair of murders. The ending isn't quite convincing but boy, I enjoyed the journey. It was only in September of last year that I discovered this wonderful series, and now I have read the eighth and final book, which I am adding to my favorites shelf. It comes to a reasonably satisfying conclusion, but still I wonder what will happen next. Since I'm not likely to find out, I will probably give the author's Vera Stanhope series a try. But I will definitely miss Jimmy Perez, Cassie, and Willow. Slow to start, with some characters that seemed to me to be familiar from earlier books in the series, not intentionally, but just as “types” we have seen before. For me, these characters did not come alive as individuals as much as in earlier novels in the series, in particular four of the adult characters: the Flemings and the Moncrieffs. These are all caricatures straight out of Midsomer Murders. Perez’s ward Cassie seems to have become a bit of a burden for the author, and almost a victim of Slow to start, with some characters that seemed to me to be familiar from earlier books in the series, not intentionally, but just as “types” we have seen before. For me, these characters did not come alive as individuals as much as in earlier novels in the series, in particular four of the adult characters: the Flemings and the Moncrieffs. These are all caricatures straight out of Midsomer Murders. Perez’s ward Cassie seems to have become a bit of a burden for the author, and almost a victim of neglect by Perez. The plot line follows quite a familiar pace and rhythm, once it warms up but there are minor incidental stories that beggar belief, such as the love letters from Dennis Gear. Since I did not enjoy it quite as much as the other seven Perez novels and it seemed to be in a bit of a rut, I can understand the author’s decision to make it the last Shetland book. Bittersweet, this one is. If you’ve been following the fortunes of Ann Cleeves, you know that “Wild Fire” is the final book in the Jimmy Perez/Shetland stories. Jimmy has decisions to make in this one, once Willow Reeves, the woman he’s been seeing, reveals some secrets of her own. In the meantime, he’s got a murder investigation (and then another) to undertake. The first is that of a young nanny found hanged in a barn where an earlier hanging has taken place. Jimmy soon learns that she was the Bittersweet, this one is. If you’ve been following the fortunes of Ann Cleeves, you know that “Wild Fire” is the final book in the Jimmy Perez/Shetland stories. Jimmy has decisions to make in this one, once Willow Reeves, the woman he’s been seeing, reveals some secrets of her own. In the meantime, he’s got a murder investigation (and then another) to undertake. The first is that of a young nanny found hanged in a barn where an earlier hanging has taken place. Jimmy soon learns that she was the caregiver for a family of unlikeable children, and the parents aren’t much better, pretty much giving up all pretense of parenting to Emma, the murdered girl. Pair that with another family that’s being targeted as “incomers” and that includes an autistic boy, and you have a lot of trouble on your hands. Ms. Cleeves knits all this together in her usual credible fashion, devising clues, red herrings and plausible and implausible conclusions. Jimmy has to get this all figured out while his personal life looms large. Will he be able to get past the “ghost” of his lost love, Fran, long enough to build a new life with Willow? Does he even want to? Questions are raised within and without, until the stunning conclusion of the murder investigation, and the completion of Jimmy’s story. First Sentence: Emma sat on the shingle bank and watched the kids on the beach below build a bonfire. DI Jimmy Perez is approached by a Helena, a woman whose family are new residents on the island. She has been receiving anonymous notes with images from the game "hangman," and asks for Jimmy's help. When Emma, the nanny to the children of the Island's Doctor Moncrieff, is found hanged in Helena's barn, where the previous owner hanged himself, by her autistic son Christopher, Jimmy calls together First Sentence: Emma sat on the shingle bank and watched the kids on the beach below build a bonfire. DI Jimmy Perez is approached by a Helena, a woman whose family are new residents on the island. She has been receiving anonymous notes with images from the game "hangman," and asks for Jimmy's help. When Emma, the nanny to the children of the Island's Doctor Moncrieff, is found hanged in Helena's barn, where the previous owner hanged himself, by her autistic son Christopher, Jimmy calls together his team, including Willow Reeves, the Chief Inspector of the Serious Crime Squad and Jimmy's occasional lover. Complex relationships hide dark secrets. Cleeves brings one into a community so small that everyone new is subject to speculation. There is a good reminder of how interconnected are people in such communities—"There are only twenty-three thousand people in the islands, and most have some connection with each other." There is an interesting shift in Jimmy and Willow's relationship. Willow is wonderfully done. She is very much an example of who many women have become; self-supporting, self-reliant, strong, not opposed to having a partner, but willing and able to get on alone if needs must while still feeling the hurt and uncertainty. Christopher and his autism is well handled. It feels just right, without being overdone. What an interesting observation regarding the popularity and gentrification of what had been small communities—"Willow wondered if it caused resentment: these confident, educated incoming, buying up the nice houses, subtly changing the character of the place. …Wouldn't it feel like an invasion?" How also true is it that one never really knows what goes on within a family—"…the whole happy-family image seems to have been a bit of a sham." Cleeves doesn't rely on twists, but when she does include one, it's very effective. She also does a very good job of increasing the level of mystery and suspense, keeping the killer's identity from the reader until the last possible moment. "Wild Fire" is yet another excellent read from Ann Cleeves. Almost as intriguing is the reference at the end to the young women on the ferry. Those who know her history can't help but suspect the character is Ann herself in an homage to a place so special to her. Most intriguing of all the is the subtle Easter egg at the end. We shall just have to wait. As for the case before that though. An interesting one. A woman comes to see Perez at home as she knew his wife, knows Cassie and has a problem. She moved to the village recently and now lives in a house where a man was previously murdered. Now that barn, the scene of the crime is the What a fitting tribute and farewell to Jimmy Perez. Having followed him and his cases since book one, this is the last in the series and there’s a very fitting ending although it’s a new start for many characters. As for the case before that though. An interesting one. A woman comes to see Perez at home as she knew his wife, knows Cassie and has a problem. She moved to the village recently and now lives in a house where a man was previously murdered. Now that barn, the scene of the crime is the scene of something more and a case involving regret, despair and...well to tell you anything else is to give the game away and you have to say farewell to Jimmy yourself. As ever, the setting of Lerwick and Shetland with a visit to Orkney is aptly and nicely done. The author loves this part of the world and it shows. Nearby islands are referred to, historical sites, local landmarks yes but also the names of birds, the type of food, sayings particular to the area, and in this novel, the Summer Solstice and the Helly Aa festival. My rating is 3.5. I took away half a star because I identified the killer before the reveal and I had some minor issues with the Perez/Willow angst. I am sorry this is the last in the series but kudos to Cleeves for ending the series before it became trite or repetitive. I will miss the Shetlands. Helena, a well known knitwear designer, her husband Daniel, an architect, and their children, Ellie and Christopher, are recent incomers to Shetland. They’re leaving behind a hectic existence in London and are hoping for a better quality and more tranquil way of life, but find some of the local community less than friendly. Christopher is autistic, a loner and ostracised by his peers. The previous owner of their new home in Deltaness, Dennis Gear, was found hanging in the barn by Daniel. He’d be Helena, a well known knitwear designer, her husband Daniel, an architect, and their children, Ellie and Christopher, are recent incomers to Shetland. They’re leaving behind a hectic existence in London and are hoping for a better quality and more tranquil way of life, but find some of the local community less than friendly. Christopher is autistic, a loner and ostracised by his peers. The previous owner of their new home in Deltaness, Dennis Gear, was found hanging in the barn by Daniel. He’d been on a downward spiral for a while but because of his suicide and the remodelling and extension to the house, their neighbours are jealous and resentful, somehow blaming them for Gear’s death. Helena has been receiving nasty little drawings depicting gallows and a hanged man and that, combined with the gossip, make her uneasy, wondering if they’ll ever be accepted. I love this series, and was glad to get back to one of the books. Shetland, as it is called by who live there, refers to the entire archipelago and includes 16 inhabited islands. The TV series is wonderful but the details about Jimmy Perez, the police inspector who works out of Lerwick on the main island, are quite different in the books. The personality is very much the same - taciturn, self contained, compassionate, lonely, and a very good police inspector. But the details of his personal life I love this series, and was glad to get back to one of the books. Shetland, as it is called by who live there, refers to the entire archipelago and includes 16 inhabited islands. The TV series is wonderful but the details about Jimmy Perez, the police inspector who works out of Lerwick on the main island, are quite different in the books. The personality is very much the same - taciturn, self contained, compassionate, lonely, and a very good police inspector. But the details of his personal life, his early life, his looks (blond on TV, dark good looks that go with the name Perez in the books) are quite different. In this final installment of the Shetland series, which began as a quartet and became a series of eight, there is a suicide, a murder, and then a second murder in a tiny community in the northern part of the main island. Inspector Willow Reeves comes from the mainland to assist in the investigation after the first murder. She and Jimmy have connected before so we wonder through the novel what will become of their "relationship". Sandy Wilson is ever stalwart and has a girlfriend. Sadly another end of series book. A little slow to start but soon picked up. Classic Anne Cleeves. So much better than the tv series. As always, a great mystery. I was so sad to see it was the last one. I will miss these books a lot. With Wild Fire being the last in her Shetland series, Ann Cleeves has once again given us a master class on how to write crime fiction. Her writing is evocative, deftly building up the characters, and every book in this series was better than the last. With her words Ann Cleeves paints pictures that bring The Shetland Isles to life, that are atmospheric, and the fog does help that, but it helps set the Shetlands as an intriguing and isolated location. It also shows how small communities, how ever close, may know each other’s secrets, but they do not know everything. When an English family move to the old Gear farm property, there are alsorts of whispers about them, even more so when Dennis Gear kills himself on the property. When a nanny is found hung is the same barn, by the autistic child, Perez kicks into full investigation mode. Hopefully in this tight knit community someone will have seen something and be able to help them. When Willow comes across from the mainland to head up the investigation, she needs to speak to Perez. She has some news for him and how he handles it will guide the course of his future. Will this news shake Perez, or just slow him down until he has worked everything out? As the investigation continues everybody knows everything but actually knows nothing so at times Perez feels they are going around in circles. When another murder happens not far from the old Gear property, they really need a break. Little did they know who would give them the break they needed to solve the case, and it leaves them shocked. But as they reveal the full horror, they can understand why some events happened, even though they disagree with them. Sad to see the Shetland series go, but goes out in style, and will we ever see Perez again? Only one person can answer that. What a great start to a new reading year. This was an excellent read and a very satisfying end to one of my favourite series. I am very sad that a series I have loved so much has finished. I will really miss the characters, but I think I will miss the Shetlands setting even more. I was sad to hear that this, book eight in the Shetland Island mystery series, was to be the last. But now having read it, the series feels complete, and it seems that Cleeves has run out of ideas to keep things fresh and interesting. Too much of this book is spent on shopworn aspects of the characters and their relationships. Jimmy thinks he’s too emotional and compassionate for this work. Sandy is portrayed as the dumb kid from Whalesy who more often than not “just doesn’t get it”. Jimmy thinks too often of his late girlfriend Fran, reminded continuously of her by the daughter he is raising. Tension between Jimmy and Willow, both professional and romantic, is at an all time high. I could go on, but I won’t. Of course, there is a murder mystery at the heart of Wild Fire, which did hold my attention and kept me (sort of) guessing right up to the last chapter. A young woman is found hanging in the barn of a family of “incomers”, a famous clothing designer, her architect husband and their two children. They have not been readily accepted (another well-worn trope!) by the residents of a small village on the mainland island. The murdered woman is a long-time nanny for the local doctor, his wife and four children. Throw in a young man who had a thing for the nanny, possible affairs, an autistic son, two old gossips and we have all the makings of an old-fashioned whodunit. Anyone could have murdered the nanny! I am so sad that this is the last Jimmy Perez novel. Daniel and Helena Fleming have recently moved to the Shetland Islands. They have bought a place that was foreclosed upon and remodeled it. It belonged to a farmer Dennis Gear who fell on rough times and lost the home. Daniel has been depressed since he discovered the body of the former owner hanging in one of the outbuildings just recently. But there is more to the story than that. Helena is the mother of an autistic eleven-year old son and a nine-year old daughter. The boy is thought to be weird and is teased by the other children at school. Helena feels that the Islanders hate her and her family and feels shut out of the community. She has been receiving small drawings of a hanged man. When the body of a young woman is found hanging in the same place as the former owner by Helena and Daniel’s son, the agony starts all over. Jimmy Perez and Sandy Wilson respond to the scene. The young woman was a nanny for a doctor’s family who have four children. She lived there for seven years. Her name was Emma Shearer. Jimmy’s on and off girlfriend and boss, Chief Inspector Willow Reeves, also shows up at the scene to assist in the investigation. She drops a bomb on Jimmy and he reacts with anger and confusion. He knows he handled the situation badly. When another death occurs, the investigation’s pace is increased. The dead woman is Margaret Riddell the mother of Magnie who was besotted with Emma. She was a vicious gossip and generally had nothing good to say about anyone. Sandy Wilson, Jimmy Perez’ partner, is clearly coming in to his own. His interview strategy has improved and he is doing a great job. He still seems rather timid at times though. Perez and Willow are getting along fine after Jimmy’s apology. I really like this series and am very sad to see it end. I kept thinking about it throughout the book. Maybe Ms. Cleeves will come up with another character to add to her Vera Stanhope/Jimmy Perez series. I sure hope so. I love her writing and I hope she keeps them coming! After much consideration, I’ve changed my rating from 5 to 3 stars. I loved this book and was disappointed in it in equal measures. The characters felt different, forced somehow. A lot was made of the characters from other parts of the UK, not the Shetland Islands. In previous books, they would have been r After much consideration, I’ve changed my rating from 5 to 3 stars. I loved this book and was disappointed in it in equal measures. The characters felt different, forced somehow. A lot was made of the characters from other parts of the UK, not the Shetland Islands. In previous books, they would have been referred to as soothmoovers throughout. Now there was one, perhaps two references. So there was a definite change on that front. For the negative? I’m still not sure. The murders seemed secondary to the plot. Now in some cases this works, as character development happens, but not this time. Very little character development occurred. Perez is given very little ‘air time’, Willow is given more and Sandy is given more than I can remember in the past so that’s a positive note. Stereotypes seemed like an easy route out: the busy body old lady who was unhappy with her life, the cool teenagers disdaining the autistic kid and the autistic kid himself, neglectful parents, young men in trouble with the law etc etc. It made for wearying reading. More positives included the description of settings, the choice of seasons, little things like describing the owners of the B&B that Willow stays in. All in all, I guess I was expecting more from the ending of a series, but instead of ending on a high, Ive been left wanting more. “Wild fire” By Ann Cleeves, is part of the Shetland series and the inspiration for TV's crime drama of the same name. It is not necessary to have read the previous books, and new readers can jump right in without any problem. Each character is briefly introduced, and current scenarios easily reveal the previous books and relationships. Throughout the series, we have watched Jimmy Perez grow and change. He is now struggling with very big changes, as continuing characters should. We know the major “Wild fire” By Ann Cleeves, is part of the Shetland series and the inspiration for TV's crime drama of the same name. It is not necessary to have read the previous books, and new readers can jump right in without any problem. Each character is briefly introduced, and current scenarios easily reveal the previous books and relationships. Throughout the series, we have watched Jimmy Perez grow and change. He is now struggling with very big changes, as continuing characters should. We know the major characters well, and the story is about their personal and professional interaction as they solve this crime. As always, Shetland is the backdrop. The opening foreshadows events to come as is Emma Shearer, aged twenty-four, employed as a childminder by a local family, sits with her friend Magnie watching the kids on the beach below build a bonfire. A young boy watches with his eyes shut and his hands over his ears to block out the sound. Jimmy Perez has a case, but he has to arrange childcare just like any other single parent. Nothing is “close” or “convenient. Assisting Perez is Willow Reeves, his senior officer, his boss. They had worked together previously, and very recently, they had a personal, intimate connection. Their relationship is complex and multifaceted, and while they make every effort to keep it secret, perhaps it is just too big to remain a secret forever. Few people know much about Emma Shearer’s personal life, or at least nothing they admit, not even the Moncrieff family for whom she had worked for seven years. Outsiders are not readily welcomed in the almost closed society on the island. Perez searches for answers because it is impossible to have secrets when there are only twenty-three thousand people in the islands, and most of them have some connection with each other. Vivid descriptions remind readers of the unique geographic setting. Conversation drives the story along, and the relationships make this a compelling novel. The characters are complex, well developed, and multi-faceted. Even the “minor” players are well defined with captivating personalities and intriguing pasts. Incomers are not always welcomed with open arms when they move to the Shetland islands. Suspicion, perhaps resentment, surrounds the Fleming family when they purchase a croft from native islander, Dennis Gear. The sale of his property was motivated by financial problems. Daniel Fleming, an architect by trade, designed the beautiful addition to the original house. It's a perfect spot for the family to have a quieter life until Gear hangs himself in one of the outbuildings. Gossip, it spreads like Incomers are not always welcomed with open arms when they move to the Shetland islands. Suspicion, perhaps resentment, surrounds the Fleming family when they purchase a croft from native islander, Dennis Gear. The sale of his property was motivated by financial problems. Daniel Fleming, an architect by trade, designed the beautiful addition to the original house. It's a perfect spot for the family to have a quieter life until Gear hangs himself in one of the outbuildings. Gossip, it spreads like wildfire. As events unfold, a second body is found hanging in the same building on the Flemings' property. Except this was not suicide and the police have a murder to solve. This is a quiet investigation with Jimmy Perez, Willow and Sandy each using their conversational skills to slowly draw out information to form a picture of what happened. Ann Cleeves is a master plotter and left me wondering to the end who the murderer was.